Have you ever had one of those weeks? A week when you think you know exactly how things are going to go? You have it all planned out. You have a lot to do, but you have time. That project at work, or that homework you put off, you still have plenty of time! And maybe you tell yourself, I work better under pressure, right? And then, all of the sudden, something unexpected comes up, and it’s something you have to do, and do now. So sure, you take care of it, but what gets sacrificed along the way? Your time gets more compressed, you are more stressed, maybe you don’t eat as well as you should, maybe the things you do get done aren’t done quite as well, or maybe you don’t enjoy them like you normally would have. And that’s kind of the way our lives are, isn’t it? We rush from one thing to the next, we fill our time with busyness and activities and distractions, almost like we’re afraid of quiet, wary of what might happen if we slow down, if we give ourselves any downtime. Blaise Pascal, a mathematician and theologian from the 1600’s, had something interesting to say about this. He said, “All of humanity’s problems stem from a [person’s] inability to sit quietly in a room alone.” Think about that for a moment. All of humanity’s problems stem from a person’s inability to sit quietly in a room alone. And we don’t have to read the many studies on this to realize the truth of it, do we? That we really don’t sit quietly very well. Why is that? We probably could tell ourselves all sorts of things, but I suspect that while those things could be true, there is much more to it. There is something much deeper going on. I think that it could be that we fear what the stillness would reveal to us. How often do we allow ourselves to slow down and reflect? What would it reveal? Perhaps a lingering to-do list, sure. But perhaps more. Perhaps things we don’t want to face. Perhaps the opportunity to reflect and grow from our experiences. Perhaps the ability to listen to God. You know, God isn’t going to konk us on the head to get our attention, at least not usually anyway. God is continually reaching out to us, but God is not going to force himself. God is there—it’s we who just don’t seem to listen very well sometimes. And maybe we don’t want to hear what God has to say to us. That’s certainly a possibility, isn’t it? I want you to picture a scene in your mind. Think about a time when you were perhaps very young and were snuggled up with a parent, maybe reading a book, maybe watching a movie together. And it seemed like there was nothing else in the world at all, just that moment. For me, it was watching scary science fiction movies with my dad. Especially the ones with the giant bugs! Or perhaps think about a time when you were with someone you cared about very much. Maybe watching a beautiful sunset, perhaps out for a walk on a beautiful day, perhaps just being together, and the moment was so special that there really weren’t words to describe it. In those moments, there was the thrill of the beautiful or unexpected mingled with a deep closeness and sense of safety, and so much more. Think about the love you felt, how safe you felt, the trust you felt. Think about your openness in that moment. Your contentment. How you felt you could take on the world, and how you were open to such possibilities. And if you’ve never had these kinds of experiences, think about the longing you may have had for it. A longing that’s just as real as it is indescribable and unexplainable. It’s a longing that is so personal, but it’s also a longing that is part of how we are wired. And for some people, it’s very hard for them to open themselves to those possibilities. As much as they desire it, as much as they crave it, still, they hold back. Because it takes a lot of trust and vulnerability to open ourselves up like that, doesn’t it? And that’s the picture we have in our passage today. “You, God, are my God.” There it is. The psalmist just puts it out there right at the beginning—God, you are my God. I am yours, and I claim you. “Earnestly I seek you; I thirst for you. I can’t get enough of you! My whole being longs for you, in a dry and weary land, a parched land where there is no water.” Think about that. Earnestly I seek for you. I look for you intensely, almost desperately. I thirst for you. Have you even been really thirsty? Really thirsty? When you are that thirsty, nothing else matters. Nothing except getting water, quenching your thirst. You can’t even live without water. It’s necessary for life. This is a very intimate psalm, isn’t it? And it demonstrates such trust. Such depth of relationship. It’s like the psalmist knows God so well that this is almost a love story. And when you love that much, you are open. Open to hope, open to possibilities, open to being more than you thought you could be. You know, this longing is real, and there’s a reason for it. God designed us to seek intimacy, and we always seek that which is ultimate. But our search, our longing, for this goes far beyond physical necessities, it certainly transcends our insecurities, and it continues until it is satisfied. And it can take us a while to understand this, but the Ultimate we are searching for is God. We are needful beings. For a reason. And when our search for intimacy and the Ultimate are joined, are realized, then we are secure in our identity as a child of God. And then the things of this world are in their proper place and perspective. Jesus Christ became human to model this for us. He is God, and he was both God and human. Jesus became human to show us how to be fully human. Jesus is God, and Jesus willingly became human and opened himself up to show us, save us. Clearly, the psalmist in today’s passage loved God deeply. And actually, the Bible is full of people who loved God so much that they were open to being used by God. Abraham, Noah, Moses (well, he was a little reluctant and needed encouragement every now and then, but he didn’t run the other direction either), Gideon, Rahab, Esther, Mary, Paul, just to name a few. One such person we meet in the New Testament is Peter. I think Peter is my favorite disciple because he was passionate and impulsive and sincere, and sometimes he wasn’t all that self-aware. At least early on, he often seemed to speak before he thought. Peter is the one who stepped out of the boat and then relied on Jesus’ help to stay above the water. Peter is the one who told Jesus to not follow the path leading to the cross. Peter is the one who said he would never deny Jesus. Peter is the one who denied Jesus three times after Jesus was arrested. Peter is the one Jesus spoke to so tenderly and directly at the seashore after his resurrection. Peter loved Jesus with everything he had, he was all-in, he was kind of an open book. And he was open to his Lord. In Acts chapter 10, we hear a fascinating story about Peter. It was a little while after Jesus’ ascension to heaven, and Peter was praying. And while he was praying, he saw a vision. And it was a startling vision, because in it, Peter saw a sheet being lowered from heaven, and on the sheet were all kinds of animals that Jews were forbidden to eat. But in the vision, a voice tells him to eat these animals. And Peter says absolutely not, that he has never eaten anything forbidden and that he never will. But he sees this vision three times. “He and his whole household were pious, Gentile God-worshipers. He gave generously to those in need among the Jewish people and prayed to God constantly.” Think about that. This was a person the Jews had been commanded to stay away from, but this person loved God and cared for God’s people. Even though he had probably been told he could not belong to God. Even so, Cornelius was open to God. And in his vision, he had been told to send for Peter. So he did. He sent three people to go get him. Notice how Peter still doesn’t know why he is there? He loved God and trusted God, but most of us would say that, too. How many of us love and trust God, are open to God, to this degree? To recognize God’s voice, and listen, and to obey. Notice that Cornelius isn’t sure why Peter is there, either. But he knew that God wanted Peter there and that Peter had a message from God for them. Talk about open! He sent for Peter “right away,” he assembled his household, and they waited. Waited to hear what God had for them. It’s easy for us to miss just how radical this was. Even the Jews who believed that Jesus was the Christ thought he had come just for them. It was what they believed their scriptures and prophecies had said. Sure, we have the writings in the New Testament now, but they didn’t have that yet. They were living it, trying to be faithful, trying to understand while experiencing challenges to their beliefs and teachings. Because Peter loved Jesus so deeply and passionately, he was able to really hear Jesus. He was able and willing to recognize when God was doing a new thing, and he was ready and willing, he was open to being used by God. And look what happened. “Even the Gentiles” received God’s word. And Christ’s salvation. Cornelius’ household received, and it didn’t stop there. The message continued to spread, no longer bound, no longer restricted to just the Jews. And what about us? If Peter had not been open to God, where would we be? And God wants this relationship, this openness with each of us. Now, I feel like I need to acknowledge here that this journey, this decision, it isn’t without risk. I imagine Peter and Cornelius knew there could be risks, but in spite of that, they listened and they trusted. And our journey could be risky, perhaps even scary, too. And not necessarily the journey itself, even, but the understanding that you will be different, that you will be letting go of some things. And those things can be comforting, can’t they? They can help us maintain the illusion that we are in control. They can tell us they will satisfy us. But those things are not fulfilling, and they’re not what we ultimately seek. They hold us back from God. And, of course, there’s the fear of letting God have all of us, of telling God all our secrets. As if he doesn’t already know. So maybe we can just hold on to that one thing. I’ve been there. Struggling through a difficult time in my life, knowing where the answers lay and wanting to be closer to God, but still yet, wanting to hold on to some things. Thinking I can follow God half-way. Because you think you’ll miss those things. Or, you like them. Or you think that holding back just a little won’t really matter. God wants all of us. God wants us to give him our all, but doing so, it doesn’t take anything away from us. It completes us, it fulfills us, it satisfies us. And on the other side of things, you understand that there really wasn’t anything to be afraid of. It can be scary to take that step, though. But as you grow in your faith and begin to take it seriously, if you believe what Jesus says, you learn that you can trust God. I want you to know that you can trust God, you can open yourself with confidence in Christ’s love, and the other things will have their proper place. 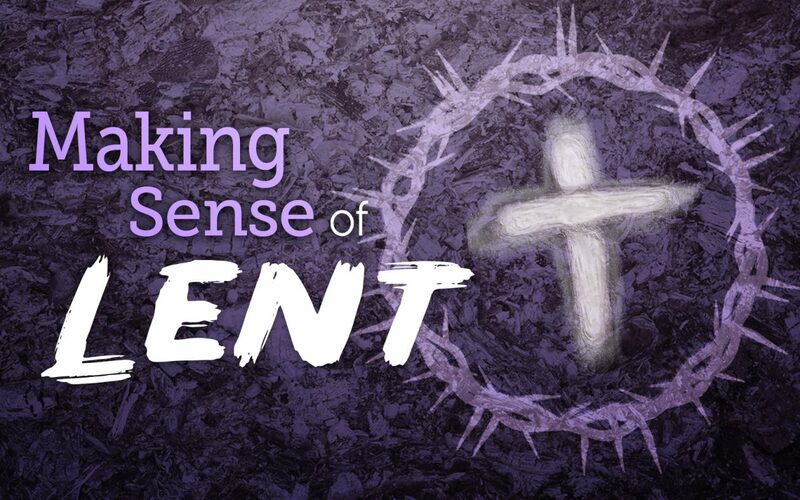 The series we’ve been in is called What is the Meaning of Lent? Lent is this time of intentionally reminding ourselves of who God is, of opening ourselves to God, of letting God speak to us, so that we can truly understand what Easter means. And we’ve learned about being reflective, being sacrificial, being foolish, being countercultural, and now about being open. The psalmist invites us to measure ourselves not by worldly standards, but by what goes on in our soul, in our deepest being. And the psalm challenges us to develop a passion, enthusiasm, a gusto for God. To start with whatever desire we do have for God, and cultivate it. And that’s what Lent helps us do. Do we long for God? Do we long for the satisfaction that the psalmist describes? Are we willing to surrender our wills so that we can participate in what we are really longing for? Are we so hungry for God that we are open to God? To what God wants to do in us and through us? God loves you and wants the very best for you. Allow yourself to be with God, to be still with God, to really be with God, and open yourself to the work God wants to do in you. In a moment, we’ll be sharing together in the sacrament of Holy Communion, and as we come, we’ll hear a beautiful song calling on God. Allow this message, allow the words of this song, allow God, into your heart. Ponder, pray, seek, allow God to speak to you. Trust God, and open yourself to God. Amen.